Buy solid grosgrain ribbon in Australia. The quality and texture of our grosgrain ribbon makes it perfect for creating korker ribbon, twisted boutique bows and any style of hair bows. You will find ribbons galore at Think Bowtique with so many shades and widths for every ribbon craft project. Grosgrain ribbon can be used for many craft projects. It's very popular for hair bows, however can be used to gift wrap presents, embellish cards and invitations. This versatile ribbon is also perfect for embellishing towels and clothing. Buy the finest quality grosgrain ribbon available. You will love our online craft ribbon, with so many colours and widths to select from. We stock everything from grosgrain ribbon, satin ribbon, fabric flowers, elastic's, tulle, rhinestone embellishments, pearl embellishment, headbands and hair clips. Grab a coffee and browse our online store. 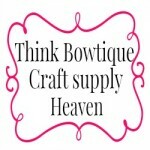 Get the lastest new on Think Bowtique and join us on Facebook.